Henry Howard Hinshaw1,3,5,6,7,8 [Howard Hinshaw9]. Hinshaw, H Howard, head-of-household, age 35, born in Indiana; completed 1 year of high school; on Apr 1 1935 was living in the same place/area; rented farm ($10/month rent); occupation: mechanic, auto garage; worked 52 weeks in 1939; $936 wages in 1939. Hinshaw, Lottie, wife, age 29, born in Indiana; completed 2 years of high school; on Apr 1 1935 was living in the same place/area. Hinshaw, Norma, daughter, age 9, born in New Mexico; completed 3rd grade; on Apr 1 1935 was living in Tippecanoe County, Indiana; attended school. Hinshaw, Reta Ann, daughter, age 3, born in Indiana. Contribution from Richard Joseph Hinshaw. 1940 census, Sheffield Township, Tippecanoe County, Indiana; roll T627-1099, ED 79-29, page 1A, line #13, household #4. Contribution from Cheryl Renee Hinshaw. 1910 census, Clay Township, Hamilton County, Indiana; roll T624-353, ED 94, page 58A, line #17, dwelling #177, family #183. Ancestry Family Tree data "Hinshaw Family Tree" posted by "RetaHinshaw36". 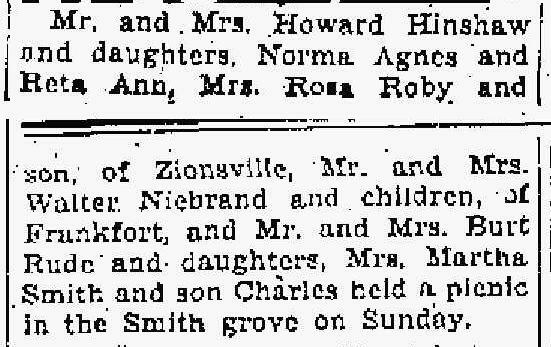 Obituary of Anna L. (Smith) Sipes; "Kokomo Tribune" (Kokomo, Indiana), Sep 16 1964; http://www.ancestry.com. Ancestry Family Tree data "A.B.Robey Family Tree" posted by "aspaugy". Contribution from Brenda Lewis ( or ). "Kokomo Tribune" (Kokomo, Indiana), Jul 15 1937; http://www.ancestry.com.